A forensic scientist specializing in questioned documents usually work cases involving alleged forgery, blackmail, kidnapping and death threats. Although questioned documents examiners are often referred to in the media as “handwriting experts”, they frequently examine evidence with no hand writing at all. 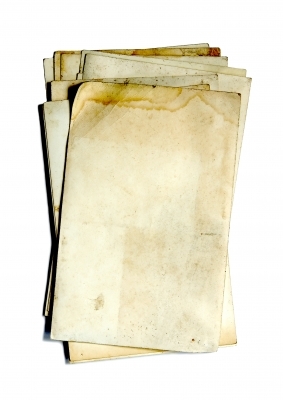 These items may include printed materials, typewritten documents, photographs, and duplicated productions (copies). It is often the task of the document examiner to determine if the item in question has been altered, forged, or obliterated. This requires the use of special light techniques, most commonly infrared or ultraviolet light. Inks and printing appear differently under certain light depending on their chemical composition and the amount of force applied to the medium. It is therefore possible to determine if more than one utensil has been used to produce a document and if more than one technique or source has been used. For example, a common tactic among forgers is to alter a legitimate check and increase the amount of the draft. A check for $100 may appear to have changed to read $10,000. 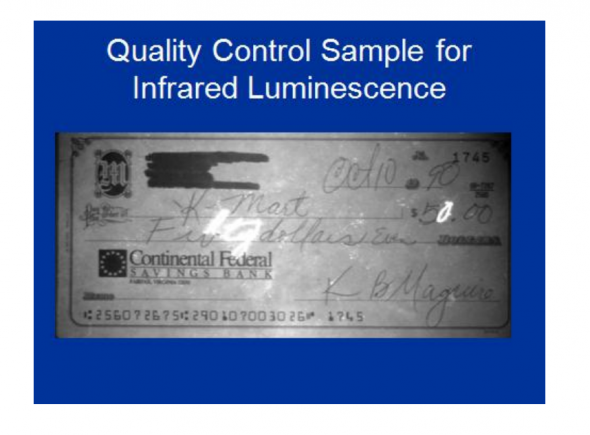 By examining the check under alternate light sources, it can sometimes become very obvious that a two different pens were used to add the additional zeros to the amount. This type of analysis is photographed and can easily be demonstrated to a jury should the case go to trial. In the case of handwriting analysis, it is possible to prove that a specific individual did or did not write the document in question. This is done by obtaining “known” samples of handwriting from the person of interest and comparing those samples to the piece of evidence. The examiner will look at individual strokes, loops, spacing , and slant. Determining that someone is NOT the source of a document is often times easier and quicker than concluding that an individual is the source. In addition to using alternate light sources in their analysis, the question document examiner will also often use various microscopes, including comparison scopes and even electron microscopes. In addition to handwriting and printed materials, the document examiner may also be asked to perform impression analysis. This may include evidence involving rubber stamps, gloves, footwear and tire impressions, indented writing and tool marks, glove impressions, and footwear and tire impressions. Training to become a question document examiner takes several months and involves case studies and laboratory exercises. The forensic document examiner must frequently work in close conjunction with latent print examiners, as there is often times a need for fingerprint analysis on the evidence as well as document analysis. Individuals interested in a career as a document expert should expect slow, methodical work and must be able to explain their analysis to a jury that often confuses the science behind this type of work with the erroneous perception that is a subjective art. Forensic Questioned Document examiners are not the same as handwriting hobbyists who assign personality traits to various writing styles or to profiling experts who analyze the content and psychological meanings of criminal evidence. Forensic document examiners in a criminal laboratory determine if a piece of evidence has been altered, obliterated, forged, or otherwise tampered with and who may or may not be responsible for the document based on careful comparison between it and known samples. Famous cases in the United States that involved question document analysis include the “Unibomber”, the “Zodiac Killer”, and the Jonbonet Ramsey homicide.